Lazy days get lazier with a drink in one hand and a book in another while soaking in the pool. Enjoy a massage at the full-service spa. Pick up snacks or grab a cup of coffee. Resort marketplace has you covered. Keep up with your daily routine at a well-equipped on-site fitness center. You don't even have to wear shoes to grab a drink at the poolside bar. Visit EFOREA for a relaxing massage, manicure or facial. The High Roller Ferris wheel is 550 feet tall and it's only 2.2 miles drive away. Feeling lucky? Wynn Las Vegas is less than a mile away. Hilton Grand Vacations on the Las Vegas Strip is a non-gaming, cashless resort located right in the heart of all the action. Get your day off to the right start at the on-site marketplace; they serve Starbucks! Grab a latte (and surprise the little ones with a coffee-free frappuccino). Now that you’ve had your morning dose of caffeine, it’s time to hit the two outdoor pools. Work on your backstroke or lounge in one of the four hot tubs with a drink from the poolside bar & grill (open seasonally). Feel like a family cookout? Take advantage of the resort’s BBQ Grills. Let the kids carry the food and condiments while you handle the plates and utensils. After lunch, get in a workout at the fitness center or treat yourself to a relaxing massage at the full-service spa. 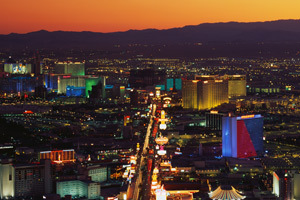 Las Vegas is known for their entertainment: everything from concerts to Broadway-quality musicals to magicians. Visit the on-site concierge for assistance with show tickets (they may even be able to hook you up with a discount!). One- and two-bedroom condos sleep four to six guests. Fully equipped kitchens allow you to save money by making your own meals. Stop by Century Food Mart for groceries; it’s just a short drive from the resort. Get in touch with your inner-Betty Crocker and bake up a batch of your famous chocolate chip cookies. Let the little ones help with the mixing (and the tasting!) All condos have in-suite washer/dryers (which will come in handy if the kids end up with chocolate on their clothes) and jetted tubs. Condos also have flatscreen TVs with premium cable channels HBO, CNN and ESPN. DVD players are perfect for family movie night. Browse the selection of DVD rentals available at the resort or bring favorites from home. Gather everyone on the couch, grab the cookies (if there any left) and get ready to be entertained. Hilton Serenity Beds (in all condos) ensure that everyone will have a good night’s sleep. Check out the Bellagio Fountains. It’s a free water, music and light show set to opera, classical, pop and Broadway music. It features over one thousand fountains, and every performance is unique. Hard Rock Hotel & Casino features more than six hundred slot machines. If you’re into High-End Gaming, you have two options: Peacock High Limit Gaming is for VIPs, risk takers and big spenders. Dragon Salon is where you will find blackjack, Pai How and Baccarat. If you get hungry, there are several restaurants. MB Steak is a luxury steakhouse, Asian Fusion offers authentic Asian cuisine and Nobu has traditional Japanese food infused with South American and Western Flavors. If you’re in need of retail therapy, head to Las Vegas North Premium Outlets. Stores include Armani Exchange, Calvin Klein, Crabtree & Evelyn, Marc Jacobs and (for the little ones) Toys R Us! Located in Clark County, Nevada along a 4.2 mile stretch of Las Vegas Boulevard South. One of the most popular tourist destinations in the United States. Known as the home of several resorts and casinos. Featuring shopping that ranges from souvenirs to high-end luxury brands.